This is the model of the post and beam warehouse frame that Mark Goyette will use as the frame for his new house. Mark's model is not as tall as the original warehouse. He decided to lower the structure so that the ceilings for his house would be 9 ft. high instead of the original 13. The warehouse was built along side the railroad in Richmond, VT, in the 1850's. It is square rule framed. By 1850 the need for consistent dimensions in industrial applications had become obvious. Many different individuals owned the various railroads. However, engines, carriages and box cars needed to transfer smoothly from one set of tracks to another - all the rails needed to be exactly the same width and profile to accommodate the wheels which also needed to all be the same dimensions. I was very interested to find out if this warehouse, built to service a railroad, was framed by geometry or the new idea of standard dimensions. Mark Goyette, who restores old cars professionally, http://www.goyetterestoration.com , was curious too; he had, after all, built the model in order to understand better what he planned to erect. So, I drew up the section of the warehouse to find out what was there. Such a simple, elegant design! The necessary width determines the square which determines the height. 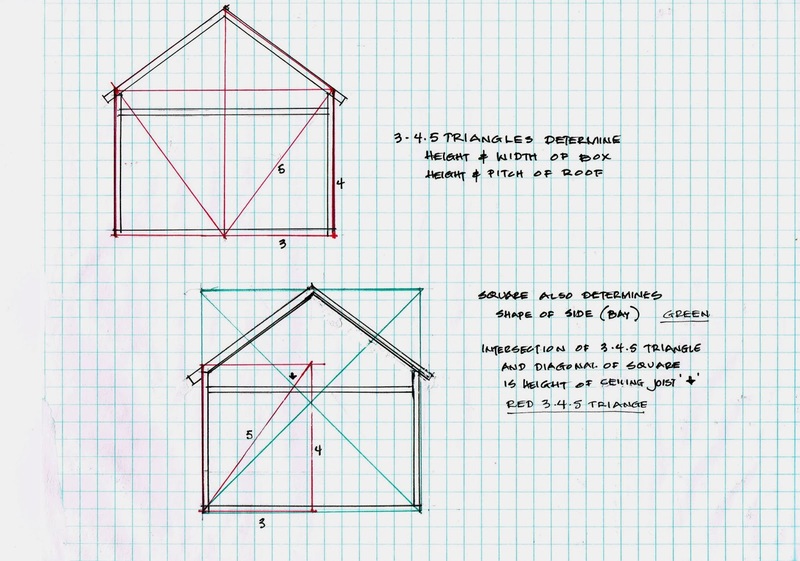 The 3-4-5 triangles determine the roof pitch. 2 3-4-5 rectangles are the box. The location of the cross tie is set by the intersection of the square's diagonal and the triangle's hypotenuse. Thanks to David B. AdolphusTravers for the photograph.